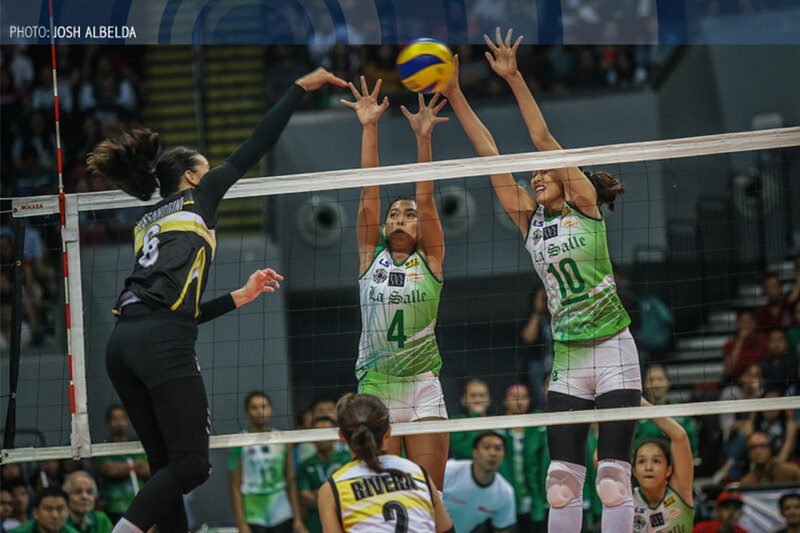 MANILA, Philippines – (UPDATED) De La Salle University opened its campaign for a third consecutive women's volleyball title on a winning note, but not before going through a nerve-wracking five-set battle against University of Santo Tomas on Saturday at the Mall of Asia Arena. The Lady Spikers displayed championship composure in the final set to come away with a difficult 25-20, 17-25, 25-22, 15-25, 15-8 over the gutsy, gallant Tigresses in their first game of UAAP Season 80 front of a capacity crowd at the Pasig City venue. Reigning MVP Majoy Baron paced the Lady Spikers with 19 points on 12 attacks, five blocks, and two aces. Season 79 Finals MVP Desiree Cheng had 12 points, while Aduke Ogunsanya added 10 markers. Kianna Dy, who was playing on a hyperextended left knee, finished with nine points in the game. The Lady Spikers weathered a stunning 28-point effort from UST's Sisi Rondina, who dragged her team back in the game in the second set with her ferocious attacks. "Talagang expected namin na hindi ganun kadaling talunin ang UST. Kahit sa Unigames, medyo nahirapan yung team namin. Although maraming bago dun sa lineup so maraming napapaikot na tao," said La Salle coach Ramil de Jesus after their win. After splitting the first two frames, La Salle outlasted UST in the third set for a 2-1 lead. The Tigresses forced a 21-all deadlock, but Baron conspired with Dy to bring the Lady Spikers to victory with clutch kills. But the Lady Spikers' level of play dipped in the fourth set. Errors by new setter Michelle Cobb, Cheng and May Luna, along with Rondina's continued aggression, helped UST surge to a lead as large as 12 points, 20-8. La Salle was unable to recover from there, as the Tigresses comfortably took the fourth set, 25-15. The Lady Spikers gave away 12 points off their unforced errors in the frame, while mustering only eight attack points. However, pressure appeared to get the better of the Tigresses at the start of the first set. Fil-Italian rookie Milena Alessandrini committed attack errors on back-to-back rallies, and they gave up two straight aces to Cobb as the Lady Spikers seized a 5-0 lead. Alessandrini made up for her earlier miscues with a block on Baron and a pair of kills to help UST come closer, 5-6. But Baron responded with a quick attack and an ace, and the Tigresses misread a Tin Tiamzon offspeed as La Salle regained control, 10-5. The Tigresses last threatened at 8-10, off a Rondina swipe. In the very next rally, however, Rondina's hit went straight to the net. It was the first of three straight errors by UST that deflated the Tigresses and put La Salle in complete control of the frame. 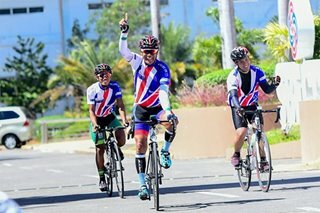 "Sa ngayon, mabibigyan ko siguro ng passing grade kasi nanalo although makikita mo naman yung character pagdating ng 5th set," said De Jesus of his team after they opened the post-Kim Fajardo era with a hard-fought victory. Cobb, the setter who replaced Fajardo in the starting line-up, finished with 37 excellent sets. Dawn Macandili had 35 excellent digs and 19 excellent receptions. Alessandrini, who stands at 6-foot-1, finished with 18 points as she took the injured EJ Laure's position in UST's starting line-up. However, no other UST player scored in double-digits. La Salle has won its opening assignment for five consecutive seasons. The last time that the Lady Spikers dropped their opener was in Season 75, when they were stunned by the Judy Caballejo-powered UST, 25-22, 25-13, 12-25, 21-25, 15-9.